For thousands of years we have done it on clay, birch bark, papyrus, sheepskin, paper, and lately in electronic media: drawing pictures and writing down our thoughts for own delight and information, and to share with others what's on our mind. In the earliest days of Northfield, Vermont, folks eagerly borrowed and loaned books, newspapers, and magazines. Reading--or being read to, if you couldn't read--was essential for entertainment and for acquiring information. In the early 1850's a small circulating library was set up in Northfield's recently built railroad depot on the west side of the common. Northfield was a major center for the Vermont Central Railroad, which was headed by Charles Paine, a former governor of the state and a son of Elijah Paine, a leading citizen who had built a prosperous woolen mill in town. 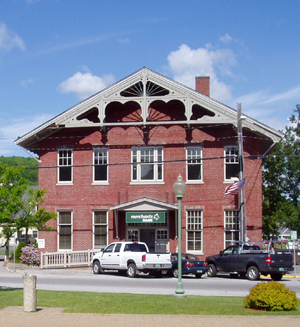 In 1856 the Vermont and Canada Railroad Association was formed, again circulating books from the railroad depot. 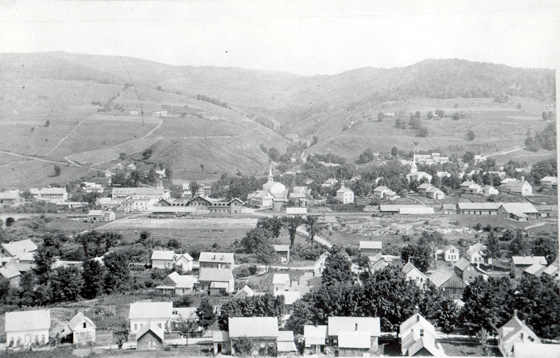 The photo of Northfield below, courtesy of the Northfield Historical Society, was taken from a hill west of town about 1865 or somewhat later. The railroad depot, which housed the town's early circulating libraries, is slightly left of center. In 1871, seventy-five Northfield citizens initiated the Northfield Library Association, paying $5.00 a share for the Association's stock and coughing up an additional fifty cents a year for dues. Shareholders paid two cents a book to borrow from the library; non-shareholders paid ten cents a book. The railroad depot was still the literary center of Northfield, for the library was located above a train shed. Below you see the depot as it stands today, minus the wings on either side. There has always been a bank in the depot ever since it was built. In 1895, the citizens of Northfield voted $50 to participate in the system of free public libraries, which the legistature had established the year before. 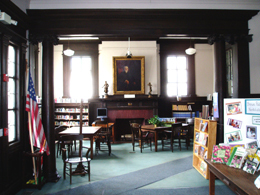 Northfield's Free Public Library acquired the assets of the old Northfield Library Association and settled into quarters in the Paine Block, a major building on the east side of the common. When a citizen paid for a license for his dog, he did his bit for Northfield culture: the dog tax went into the library's coffers. The Paine Block burned down and the library was established in the Union Block, which burned down in 1904. Fire could not destroy Northfield's determination to have a free public library and the books were installed in the house of a private citizen on South Main Street. Now George Washington Brown comes on the scene. He was a Northfield boy who at eighteen started out as a timekeeper in a machine shop of the Central Vermont Railroad in Northfield. He worked his way up in grocery and hardware businesses, became an auditor for the Central Pacific Railroad in California, and eventually served as the general manager and treasurer of various firms that made machinery for shoe manufacturing, ending up as a vice president of the United Shoe Machinery Company. He had become a very wealthy and prominent businessman in the Boston area, and a patron of the arts, particularly music. 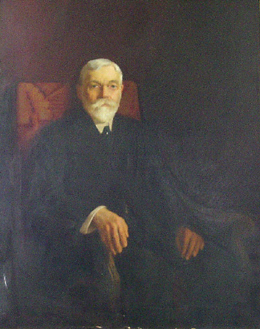 Brown's portrait hangs over the fireplace in the north reading room, where the tables may have a puzzle to work on and a display of interesting books in the collection. Patrons can read, take notes, or work with a laptop computer at the tables. Brown offered to build a library for Northfield for $20,000 to $25,000 dollars in memory of his grandparents, parents, and wife. The site purchased for the library was the former home of the late Charles Paine. Paine's home was moved sixty feet north, and now houses the Northfield Historical Society. Brown supervised the design of the library, which is similar to the design of the Carnegie libraries, but which had some interesting new features, such as a fireplace in each of the two reading rooms, cypress woodwork, and lead pane "starburst" windows with "bull's eye" centers. On August 21, 1906, George Washington Brown spoke at the dedication ceremony in the Methodist Church across the street from the Brown Public Library. He recounted how as a boy he earned money "carrying passengers to funerals, tolling the bell for deaths and funerals, and driving the hearse." When he was twelve, he said, he "performed the latter service when the remains of the lamented Governor Paine were borne to their last resting place." Little did the twelve-year-old boy know that decades later he would erect a public library on the site of Charles Paine's homestead. 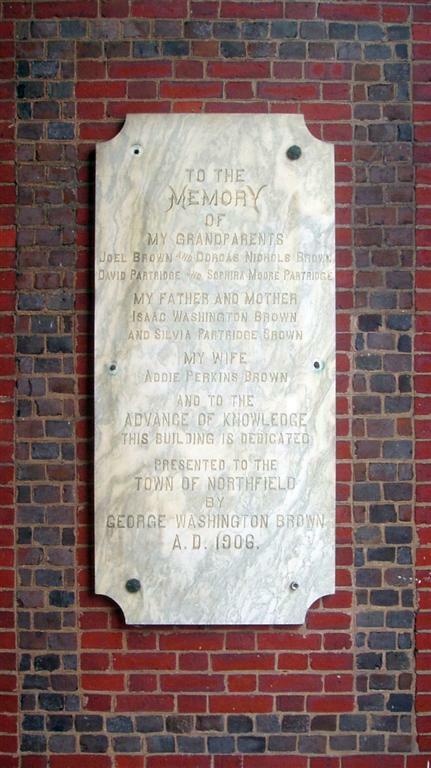 On the marble plaque at the main entrance to the library George Washington Brown dedicates the building to his grandparents, parents, and wife and "to the advance of knowledge". Valuable sources of information on the history of Northfield, Vermont are Julia W. McIntire, Green Mountain Heritage: The Chronicle of Northfield, Vermont, Canaan, NH: Phoenix Publishing, c. 1974, and Julia W. McIntire and Richard L. Cleveland, Picture Northfield: A Photographic Study, Northfield, VT: Northfield Historical Society, c. 1985. Click here to learn about Mary Ann Paine's Painting of Northfield.